It’s funny, we talk about limitations as if they were a bad thing. As if eternity and infinity and boundlessness was superior to now and today and here. But we all know that nothing motivates like a deadline. We all know that some of the best poems are sonnets. We all know that the bloated budget film is often worse than the tight little indie feature (the Lord of the Rings films vs The Hobbit films anyone?). N. Katharine Hayles (1999) has already effectively addressed this tendency, (and I’ve already written a riposte to this point, another attack on the disembodied life of the mind), and so I’m not going to rehash that particular argument here. Instead, I’m going to talk about the value of embodied, limited learning. Now, all learning is embodied–it doesn’t matter if I’m sitting at a computer or not. In fact, our bodies limit our ability to learn online as much as they do our learning offline. Eye strain, bad backs, RSI… The challenges that sight impaired people have navagating websites, and how hard it is to type when you’ve sprained your wrist. The limitations of bandwidth, mobile data plans, hardware… It’s so ubiquitous that people try to make them transparent or invisible. But cultural studies are all about making the invisible the focus of reflection. And my practice is all about doing little experiments in learning/research/writing and then reporting them back to you. And today, I’m going to report on a very successful experiment with a notepad, some books, a library, some terrible wi-fi, and a short working day. Monday is my day for doing my Masters study. This works really well for me, because I both have enough time to read, think and write, but I also have to get on and do the work, because I have no time for it in the rest of the week. I find it takes me about 5-6 hours a week, and that’s about the limits for the brain to do focused, active learning. I know my circadian rhythm, and that I’m definitely most alert in the afternoon. I used to be only able to write between 5pm and midnight, but over time I’ve managed to train myself to be able to function at that level between 11 and 6. On Mondays, I spend the morning running errands, paying bills, going to appointments, and the afternoon working. And so it was on this Monday. I am in the foundational research phase of my assignment writing. I’d got a reading list from a friend who is working on a PhD in this area, and went off to the State Library after lunch to do my research. 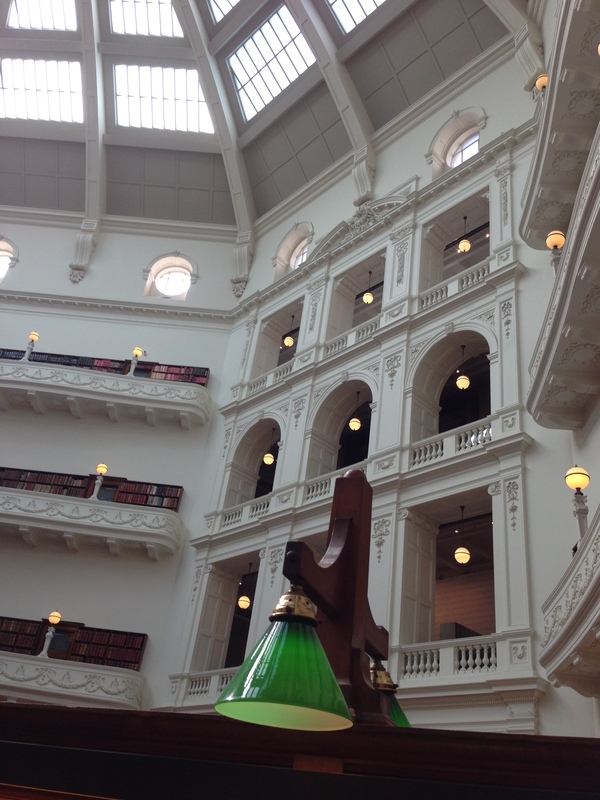 The State Library is a fantastic place to do work in–under the great glass dome are these gorgeous old fashioned desks, and it’s beautiful and quiet and light and inspiring. I was reading this article online and taking notes by hand. I prefer a fine line felt-tip pen or a mechanical pencil to write with. This Artline pen has a great tip, but the barrel is pretty fat (and has ‘hold me properly’ shaping which annoys me). I do hold my pens correctly, and have a lump on my middle finger to prove it, but I also have small hands. 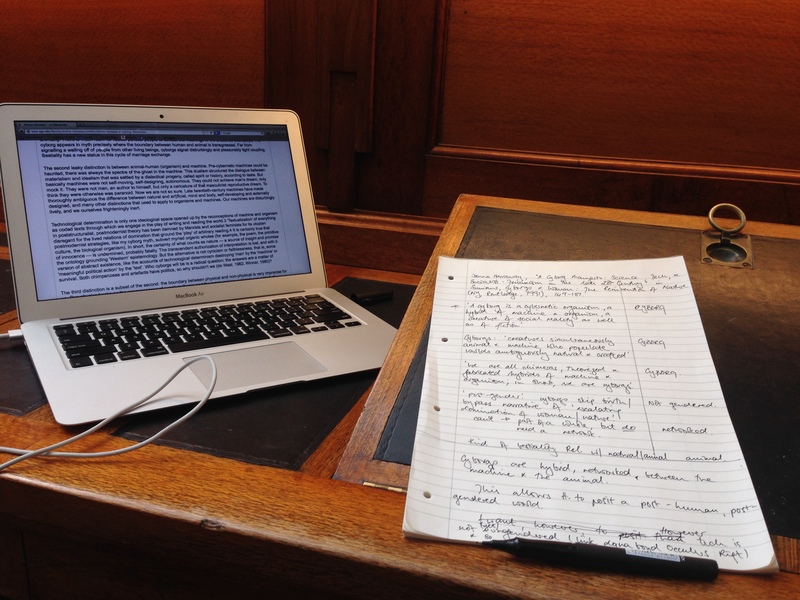 The State Library has these gorgeous old desks that can be made into a writing stand. This means that you can write without hunching over the desk, so it’s great for my back. The chairs are comfortable too. But they have also put in a laptop charging plug into each desk (you can see my power cord in the picture). What they don’t have is great internet. The wi-fi is really slow, when it works at all. So I was toggling between refreshing my DNS settings, hot-spotting with my phone, and not bothering. So distractions were reduced to what I could get on my phone (so basically Twitter). At 4pm I staggered out of the reading room in desperate need of a break. I walked down the stairs to stretch my legs, went to the cafe on the ground floor, and took the time to have flourless pear cake, a strong flat white and a flick through the paper. Then it was back to the reading room to start on the books. The limitations of embodiment were pressing in on me. The reading room was much more crowded than it had been after lunch. My eyes were starting to feel tired and gritty. My fingers hurt from writing (yes, I’d taken quite focused, specific notes, but I’d been doing it for 3 hours and I’m out of handwriting practice). I needed to leave at 6pm so I could walk home to make dinner to feed our house guest. What’s more, I was consulting physical books, 3 of them, that I couldn’t borrow. I had 90 minutes, 3 books, and was already tired… how could I do anything useful? Okay, so there are some things you can take away from this. Remember you are a body and your brain is an organ. Think about where you work, and how. Can you improve your desk, get a cushion for your chair, add a desk lamp, stock up on your favourite pens? Do you have a poster, a window, a pot plant for you to look at and inspire you? Are you taking your lunch breaks? Are you taking enough tea breaks, drinking enough water, stoping to stretch? Use the Cornell Method of note taking. Writing notes by hand is an effective active learning method, and forces you to be more selective in what you write down. Of course I didn’t read every word of those books in 30 minutes. Instead I started with the metadata: blurbs, tables of contents, indexes, headings, to select the sections that seemed most useful. I started skim reading, mostly focusing on topic sentences. This enabled me to differentiate between ‘here Haraway talks about cyborgs‘ (very relevant to my project, so I slow right down and take detailed notes); vs. ‘this is a side point‘ (not at all relevant, so I skip it); vs. ‘this is another page of Haraway talking about Boyle and the invention of the laboratory‘ (not so relevant, so 6 pages gets a single sentence and the page numbers). 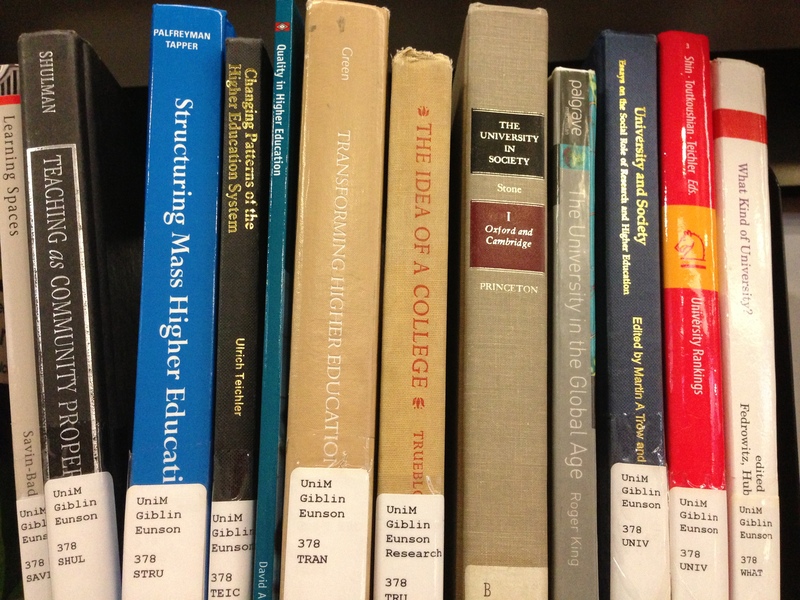 I can always go back if I need to, but for a 2,500 word essay, I’m going to want one definition and a couple of terms… and even skipping as much as I did, I took 2 pages of notes for each book. I’ve got more than enough. Get over your fear of missing out. Or your perfectionism, or whatever it is stopping you using my advice. This post is about how productive limitations are. If I could have borrowed those books, I would have read one, and taken the other two home… where they would have sat on my desk for two weeks. The same if I had been able to read them later as eBooks. When I was doing my PhD (before I learned this lesson) I probably would have taken a 8 or more dense pages of notes, even though I would still only quote one definition and a couple of terms. Because of my limitations of time and place, I needed to be focused, but I also needed to be critical. Before I wrote down a note, I had to judge if and how it was going to improve my argument in my essay. This means my notes are better quality, and that at the end of the reading day I already had formulated a sophisticated argument and plan. Like an art film, bigger doesn’t have to mean better. Like a sonnet, limitations can help us craft something more polished. Tight deadlines help us to get things done. Walk home through the gloaming, with the city lights coming on, and the sound of a busker playing jazz, and take the route through the park with the pretty fountains. And when you get home, put on your favourite cardigan, and hug the one you love and play with your cat and drink good wine. You know, or <insert your own preference here>. Bodies and brains are amazing, and we’re lucky to have them, and we should enjoy what we have, every day. Previous Freshly Pressed: and welcome! I soooooooooooo love this post. Thank you for it! I would post more, but deadlines call. 😉 Take care! I love Katherine Firth’s post on embodied learning. It gets at all sorts of wonderful points behind my need to do not just pomodoros but S.M.A.R.T. pomodoros. Epiphany: Ah! I just realized: Your post resonates with the S.M.A.R.T. pomodoro technique as I explain here: http://wp.me/p1XRia-tt. I love being able to juxtapose the two to give the S.M.A.R.T. pomodoro technique context. Many thanks, and blessings! There’s so much truth in this post for me – I think that creativity is spurred by limitations, because once we have a road block, we switch from “open inspiration” mode to “problem solving” mode – and I think the latter is more exciting and insightful than the soft part of us waiting for our muse to land! Thanks Michelle! Certainly the latter is more useful for getting something defined done–like ‘doing the research reading’ or ‘writing it up’! Interesting and useful, thanks for sharing. Procrastination – the bane of my life. A professor gave me a good tip – the hardest part about writing a paper is the first line, the first paragraph. So, just write anything. Two or three lines of blurb. YOU’VE CRACKED IT. Then it flows. And once you’re in the zone, you’re off. Return to the first three lines later, and edit edit edit. Absolutely! I often recommend a 10 min ‘writing warm up’ where you just spend 10 mins writing ANYTHING. Of course you don’t need 10 mins, just a few lines, so by the time the bell rings people are well into it!